On the whole, wombats are endearing animals. They keep to themselves, are quiet neighbours and their babies are just downright adorable. Coming home from the morning walk with the dog one day a few months ago, there was a baby wombat playing at the entrance of the burrow opposite my front gate. This particular wombat burrow is dug into the soft soil of the road embankment, and given that this is a dead end road and there's only one gate further along from mine, there's no danger of the wombats being hit by cars or undermining any infrastructure. I took a photo of it a couple of years ago (right) by getting my head and shoulders into the wide entrance and then extending my camera down as far as I could reach. I have no idea how much further it goes, but it's quite an architectural achievement. I like wombats in their natural habitat. It's when they decide to share mine that we have a problem. Two winters ago a wombat decided that the space under the yurt would be a nice place to dig a hole, and proceeded to do just that. Now, while I like wombats and wildlife in general, and I am more than happy to share my space with them on the basis that they, as a species if not individually, were here before me, there are limits. 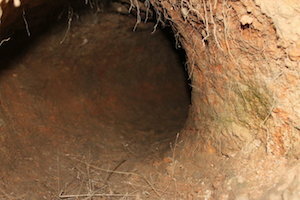 The excavation of the electrical cables and the construction of a burrow under a stump of the house was that limit. The wombat had to go. Slow down for wildlife ... and birds are wildlife too! The moral of the story below: please slow down on our country roads. We might think we own them, but we share them with wildlife and these critters are important. 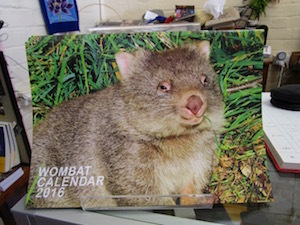 So important are they that I think everyone should support the cause by buying a 2016 Wombat Calendar. The baby magpies that hatched in spring have left the nests and are learning to fend for themselves in the wild. Unfortunately, ‘the wild’ also involves traffic, which, on our country roads usually travels at a speed not conducive to allowing immature birds the space and time they need to get out of the way.The result of this is that the Cooma Road looks like it's open season on baby magpies. While the adult birds are able to negotiate their way around cars and trucks and get out of the way in time, the little ones simply haven’t acquired the skills yet. Yesterday evening driving home from a book launch at the shop I saw what I thought was a dead baby magpie in the dust at the side of the road where it has been dug up for roadworks. As I passed it, it flapped a wing and tried to move away from the road. It was about 7.45pm, the sun hadn’t set but the shadows were long and deceptive. Did it really move or was it the wind? The arrival of another Christmas season is a good time to review how and where we spend our consumer dollars. While online shopping is fast, convenient and allows for quick price comparisons for the thrifty shopper, it often comes with hidden drawbacks, such as postage or delivery costs and the question as to whether goods will actually arrive in time for Christmas. Heading to the mall, for many, is about as appealing as taking a dip in the shark tank at Sydney Aquarium – and possibly less safe – but the advantage of finding everything under one tinsel-decked roof is undeniable. Research is showing, however, that increasingly, shoppers are turning to their local high streets. 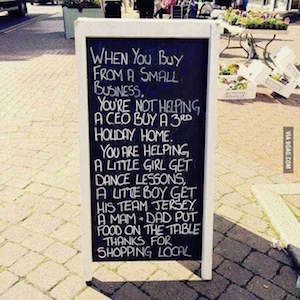 The economic benefits of shopping locally are well documented. While multi-national chains write their own rules and often have negative impacts far beyond the sight of the individual consumer, local businesses can generate wealth in ways that are both equitable and sustainable. Research in 2010 found that for every hundred dollars spent in a local bookstore, $45 stayed in the local economy. Conversely, for every hundred spent at a chain bookstore, only $13 stayed in the local community. The key differences are that local shops are owned and managed locally, are more likely to use local banking, accounting and legal firms, and local suppliers. Small businesses create local jobs and this, in turn, puts more money back into the local economy.